Rancho provides a variety of specialized treatment services within an open campus setting. Each resident receives a thorough assessment upon entry, and then is referred for group, individual, and family counseling within an assigned comfortable living unit. 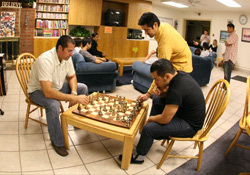 All residents participate in Social Skills Training and daily group therapy. As residents move through the program, they may also be referred for Substance Abuse Treatment, Anger Management or Gang Intervention depending upon individual needs. All treatment services are supervised by licensed clinicians and certified counselors.